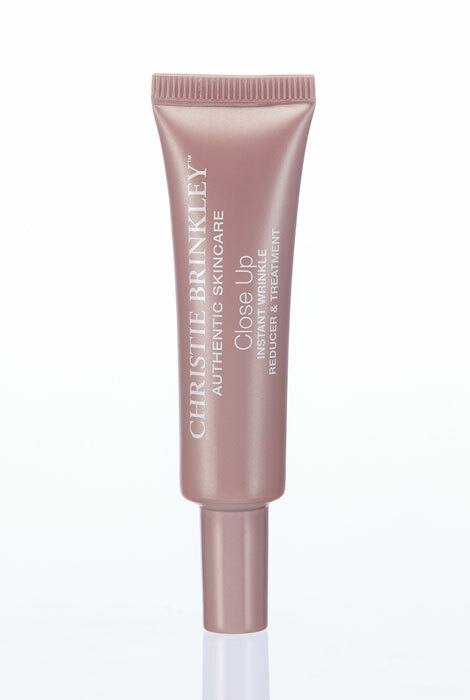 Delivering an immediate sensation of tighter, smoother looking skin, Christie Brinkley Authentic Skincare Close Up Instant Wrinkle Smoother & Treatment works on contact ... and the beautiful results last for hours. Infused with vitamins and light diffusing silica crystals, the deep wrinkle treatment helps ease the look of under-eye bags and puffiness while minimizing the appearance of wrinkles and can be used around eyes, mouth and on forehead—anywhere you want the illusion of tighter, younger looking skin. Simply apply a small amount to fingertip and sweep under eyes, over fine lines and wrinkles. The gentle formula can be reapplied throughout the day and washes off easily with water alone. 0.33 oz. Water/ Aqua/ Eau, Adipic Acid/Neopentyl Glycol Crosspolymer, Dimethicone, Hydroxypropyl Methylcellulose, Copper Lysinate/Prolinate, Methylglucoside Phosphate, Pullulan, Porphyridium Cruentum Extract, Glycerin, VP/VA Copolymer, Acrylates/C10-30 Alkyl Acrylate Crosspolymer, Amodimethicone, Caprylyl Glycol, Ethylhexylglycerin, Trisodium Ethylenediamine Disuccinate, Sodium Hydroxide, Phenoxyethanol, Chlorphenesin. After moisturizing apply with circular motion onto targeted areas. Press and set for up to 2 minutes. I like the blurring effect on my lines and wrinkles. It works! I received a sample of this skincare close up instant wrinkle smoother in the mail and now I'm sold. can you put make up on over it? BEST ANSWER: Yes, I regularly put foundation over it.